Friday 18 January. 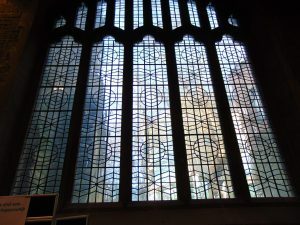 We drove into Newcastle and I went for a walk while Julie and our friend Katie spent a happy few hours in Waterstone’s. I went to J&M Sewing Services to buy new clerical shirts – they have a website at https://www.jandmsewing.com/. 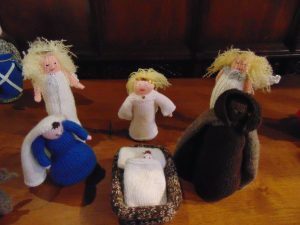 I have been a happy customer since they came to Lincoln Theological College in 1992. 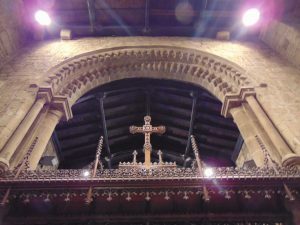 They are such an Anglican institution I think they should really have their own blog page. 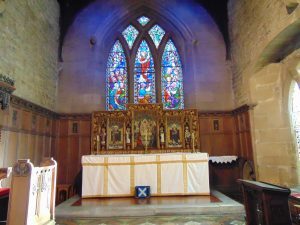 I walked back via St Andrew’s church. 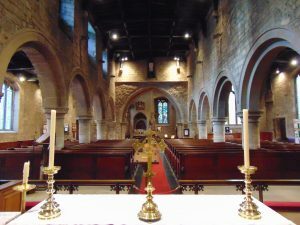 It is silly that in the seven years I lived here, northernvicar went into the depths of Northumberland, but failed to visit all the churches in the centre of Town. 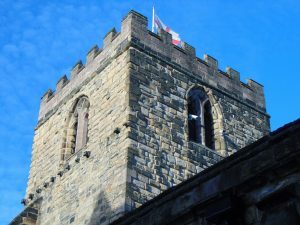 St Andrew’s is on Newgate Street, not far from Eldon Square, and has a websit – http://www.standrewsnewcastle.org.uk. 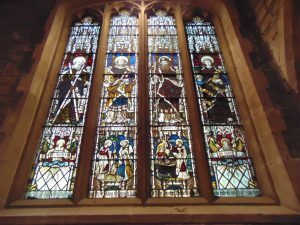 It has a busy ministry working with Chaplaincy across the City, and traditional Book of Common Prayer services in church. 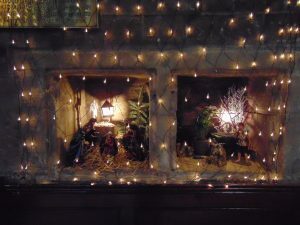 The nice thing was I found it open, lit and warm. Thank you! Excellent guidebook too. 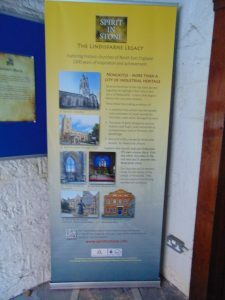 Good to see the heritage of Inspired North East too. 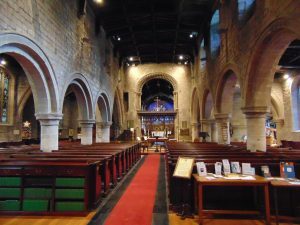 Here is the Nave and the Norman arch, and a lovely collection of Offertory bags. 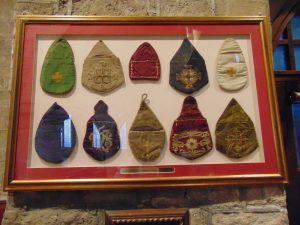 Beauty in masonry and embroidery. 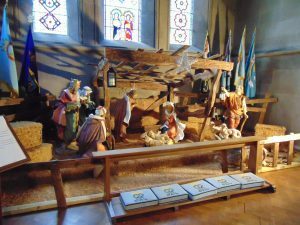 They had a lovely selection of Cribs on show – here are three of them. They had obviously been working with local shops and businesses. 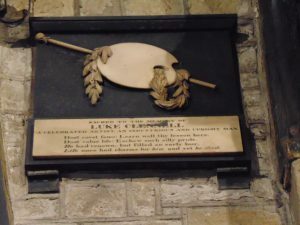 There are some interesting memorials in the Chancel. 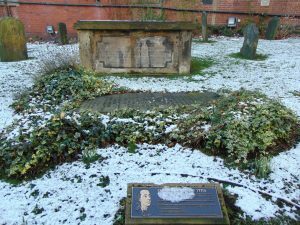 The Reverend Henry Griffith died in 1837. 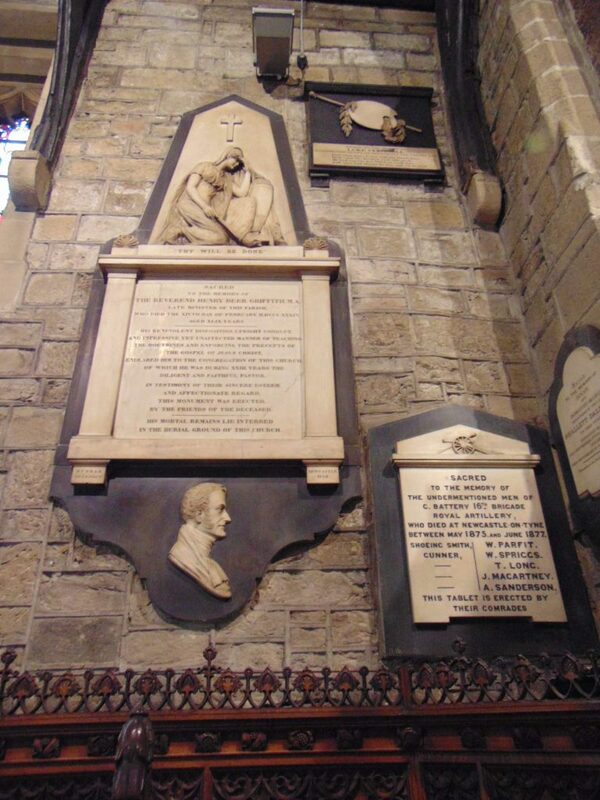 The tablet is by David Dunbar and shows a seated classical figure above the text and a portrait of Griffith below. 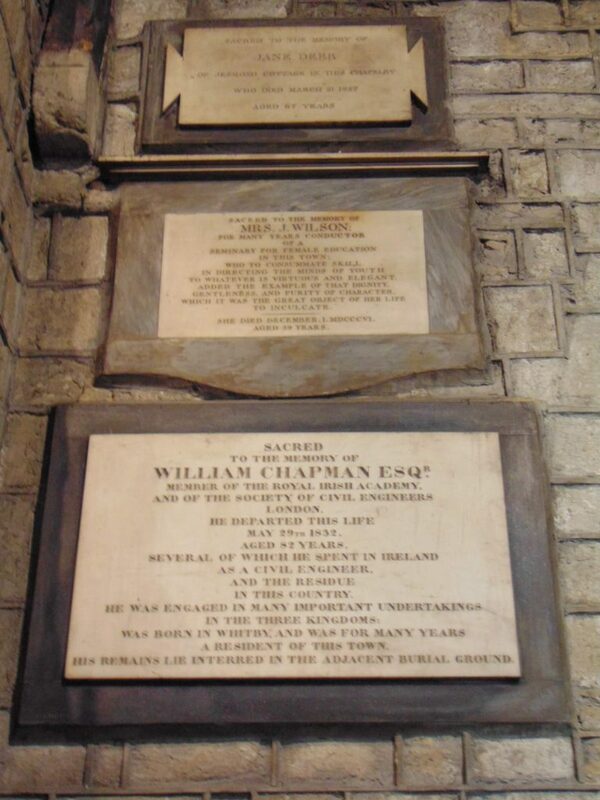 William Chapman (1750-1832) was born in Whitby, and was captain of a merchant vessel by the age of 18. He trained as a civil engineer and found work as consulting engineer to the Grand Canal of Ireland. In 1795 he was involved in a survey of a proposed canal from Newcastle to the Irish Sea (a project which never came to fruition – eventually the Newcastle-Carlisle railway did the job. Apparently he was involved in a design of the first skew bridge, invented the coal drop (patented circa 1800), and the bogie. Luke Clennell (1781-1840) was one of the most gifted pupils of Thomas Berwick. Sadly he had a mental breakdown, and his last years were spent most as an inmate of the lunatic asylum on Bath Lane. He was buried in an unmarked grave, but friends later subscribed to this marble tablet. 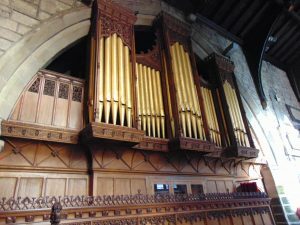 The organ is a Binns of 1895, rebuilt by Harrison in 1971. 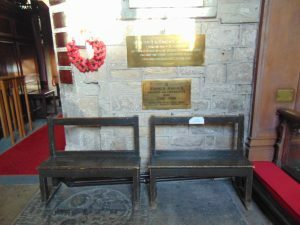 There’s a couple of Paupers’ benches, East Window, and a Nave altar. 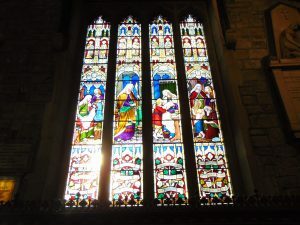 Some Victorian stained glass, and one with no colour in. 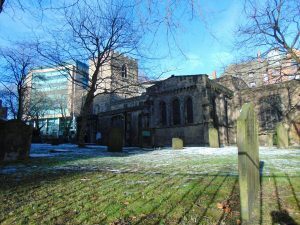 Outside is the grave of Charles Avison, a Georgian musician – https://newcastlecollection.newcastle.gov.uk/charles-avison. I don’t know his music, I can listen to a Radio 3 podcast – more to discover! Back at Waterstone’s the girls were still discovering.